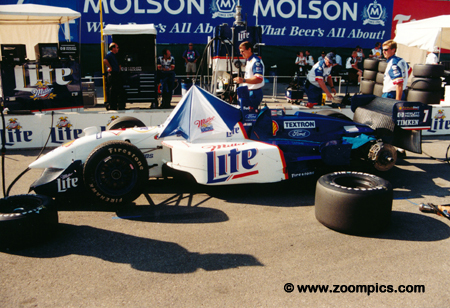 The 1998 Molson Indy Toronto was eleventh of the nineteen rounds that year. The race took place on a 1.76-mi/2.82-km temporary street course using the Toronto Exhibition grounds. The event debuted in 1986 and proved very popular with local race fans. The race included six former winners - Bobby Rahal (1986), Al Unser Jr. (1988 and 1990), Michael Andretti (1989, 1991, 1992, 1994 and 1995), Paul Tracy (1993), Adrian Fernandez (1996) and Mark Blundell (1997). Alex Zanardi drove a Reynard 98i powered by a Honda engine for Chip Ganassi Racing. Zanardi had a very successful 1998 season winning seven races and finishing on the podium in 15 of the 19 events. Needless to say, he won the 1998 title and by a large margin – 285-points to 169-points earned by his teammate Jimmy Vasser. Despite a race day engine change, he won the event. The No. 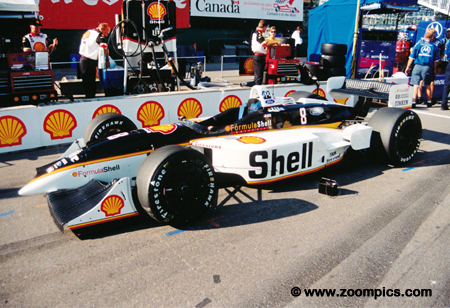 2 Penske PC-27 was powered by a Mercedes-Benz IC108E and driven by Al Unser Jr. Unser was teamed with Andre Ribeiro. 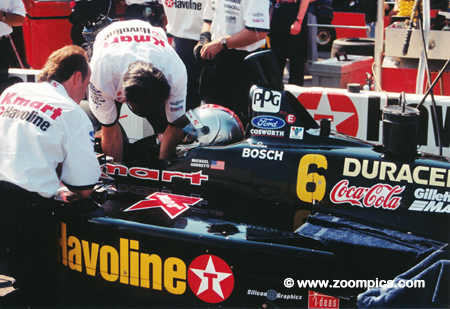 1998 was not representative of the usual Team Penske results. The best results occurred early in the season when Unser had two podiums - a second in Japan and a third at Milwaukee. Ribeiro didn’t fare as well – his top finish was a seventh in Vancouver. The team went winless in 1998. This is the Della Penna Motorsports Swift 009.c which was powered by a Ford XD V8t. 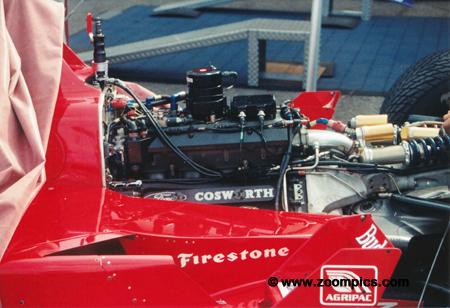 The Ford X-series was produced by Cosworth Engineering and was introduced to Indy Car racing in 1992. The first in the series was the XB which was a 2.6-liter turbocharged DOHC V8. This engine produced over 800-horsepower at 14,000-rpm. 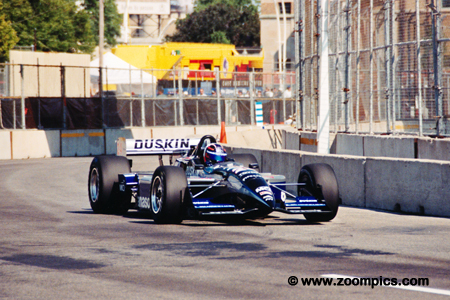 Toronto agreed with the Michael Andretti – his visits to the temporary street circuit had netted him seven-wins. His total may have been eight but with three laps to go in the 1998 event he was passed by Alex Zanardi in the hairpin. Andretti, driving the Newman-Haas Racing Swift 009.c, finished second after a third-place start. 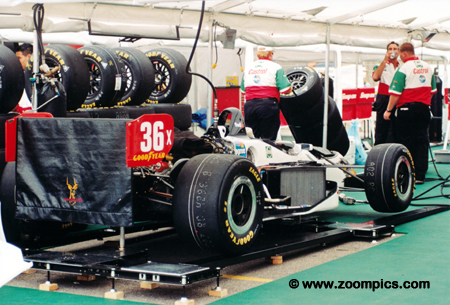 Dan Gurney’s All American Racers returned to Indy Car racing in 1996. The team built their own chassis called an Eagle 987 and they also used a Reynard 98i. These cars were powered by a 2.6-liter V8 engine supplied by Toyota. In 1998, the team drivers were P.J. Jones, Alex Barron and Vincenzo Sospiri who replaced Jones for the last four races. The teams best finish was an eleventh by Jones at Long Beach. 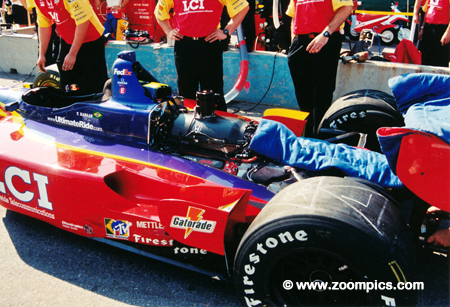 Jimmy Vasser started the Toronto race in sixth and finished third. The 1996 Indy Car series champion, drove a Reynard 98i powered by a Honda HRK V8t for Chip Ganassi Racing. The Honda engine and the Reynard chassis proved to be a dominant combination. 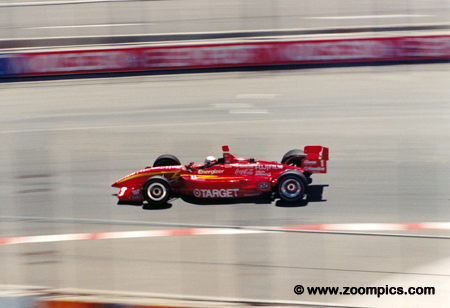 Combined the Ganassi duo of Alex Zanardi and Vasser won ten CART races and secured twenty podiums. 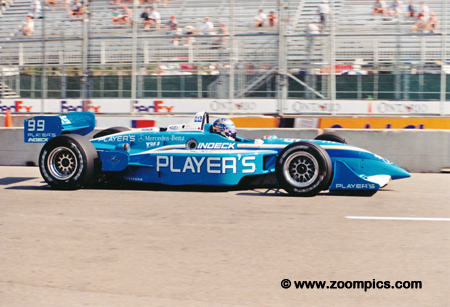 Canadian Greg Moore was building a reputation as not only a threat for race wins but also the series title. Up to this time, Moore had the distinction of being the youngest driver to capture a series to win - 22-years old. At Toronto, he qualified twelfth and finished eleventh. Despite his poor showing in Toronto, he captured victories at Rio and Michigan. 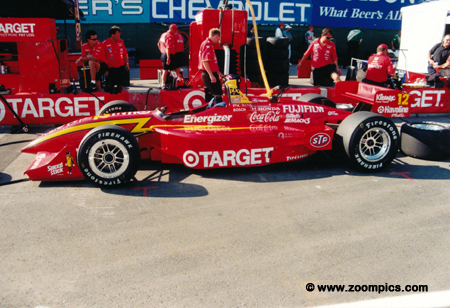 Bryan Herta drove for Team Rahal from 1996 to 1999. In 1998, the team used Reynard 98i powered by a Ford XD V8t. At Toronto, he had an impressive drive starting in the seventeenth position and finishing fifth. Herta had three podium finishes during the season – two thirds – Long Beach and Portland capped by a win at Laguna Seca. But 1998 also included eight retirements and an eighth in the final standings. Honda introduced the HRX engine in 1994 and it was used by teams into 1995 until it was replaced by the HRH. 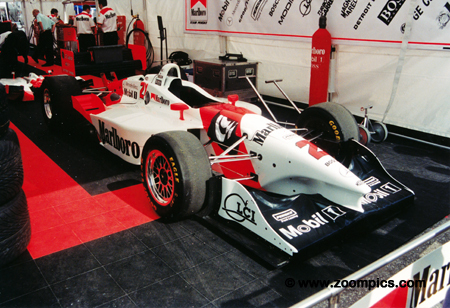 For the 1997 season, Honda developed yet another motor the HRR. Their fourth generation power-plant, used in 1998, was designated the HRK. This V8 engine was the lightest and smallest to date. 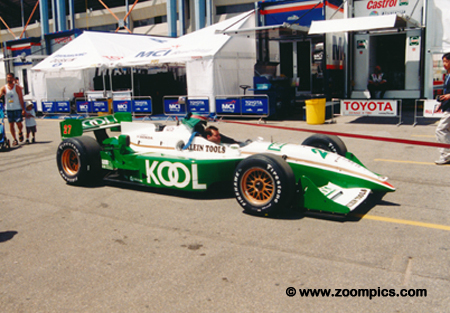 Honda teams included Target/Chip Ganassi, Team KOOL Green, Walker Racing and Tasman Motorsports. Starting on the pole for the 95-lap event was Dario Franchitti in Reynard 98i - a repeat of his 1997 performance. Franchitti dominated much of the race but with 16-laps to go he spun and stalled in the first turn. Unfortunately, he was “t-boned” by his teammate Paul Tracy and forced to retire. The No. 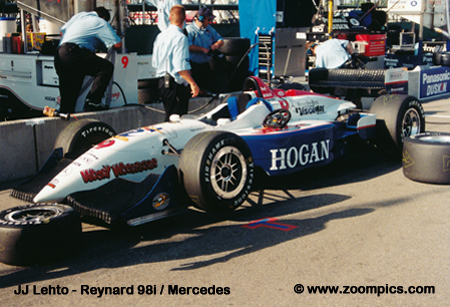 7 Reynard 98i was driven by Bobby Rahal. At Toronto, he finished fourth after qualifying ninth. During his career, Rahal won the Indy 500 as a driver (1986) and team owner (2004). He also won the Indy car title in 1986, 1987 and 1992. Rahal retired after the 1998 season. Robby Gordon captured his first career pole in 1994 at Toronto driving for Walker Racing. In 1998, Gordon drove a Toyota-powered Reynard 98i for the Arciero-Wells Racing team. He replaced Hiro Matsushita early in the season and had his best finish, a seventh, at Nazareth. At the Toronto event, he started twenty-second and finished fourteenth.